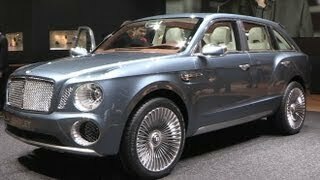 At this year's Geneva Auto Show Bentley unveiled their first take on an SUV, the Bentley EXP 9 F Concept . It appears that the carmaker aims big from the very start, and plans on making their debut on this particular segment with a super-premium crossover that offers the highest degree of luxury and outstanding performance. It all starts with the name of the Concept, the "Bentley EXP 9 F" where "EXP" stands for the EXP Speed 8, the race car that won the Le Mans event a few years back. The "F" stands for Falcon, the fastest moving creature on earth. In other words, Bentley's first-to-be-launched SUV boasts a whole lot of sporty characteristics. Well, let's take a look at what resides under the hood. The EXP 9 F is equipped with a 6.0 liter twin-turbocharged W12 engine coupled with an 8-speed close-ration transmission. The entire package develops 600 horsepower and 800 Nm of torque. However, this might not be the only engine variant available once the crossover hits the market. Bentley is also exploring the possibility of adding the recently launched 4.0 liter V8 petrol engine in the mix, a unit that produces 500 horsepower. Last but not least, the carmaker is also planning on building a plug-in hybrid version equipped with a V6 unit. This alleged hybrid will boast a 30km range on full electric mode alone, while offering capabilities of accelerating from 0 to 100 km/h in just under 5 seconds. The exterior design reflects the crossover's "muscular" nature. Some of the most notable features are the day-time running lamp apertures which also act as air intakes for the engine. These aesthetic elements give away the fact that the people behind the car's design drew inspiration from the famous Blower Bentley. Other exterior features include a set of 23 inch alloy wheels with multiple spoke design, the matrix grille and the prominent rear wheel arches. 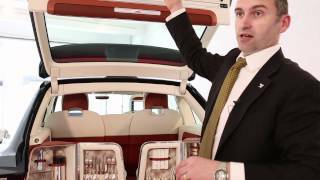 On the interior there's no shadow of a doubt that Bentley intends on delivering the highest possible level of luxury, with numerous elements made from materials such as polished metals, bronze and gunmetal, the full-width wood dashboard and a panoramic glass roof. The rear seat passengers will have the option of choosing between two configurations, including business mode that offers a fold-down keyboard and generous legroom, or a more reclined position offering a drinks table, an infotainment screen and powered footrests. The Bentley EXP 9 F SUV is without a doubt a crossover that aims big, and the estimated price says it all. The British SUV is expected to hit the market by 2014, wearing a price tag of roughly $200,000. The price alone separates the EXP 9 F from the Porsche Cayenne and the VW Touareg, if not anything else.